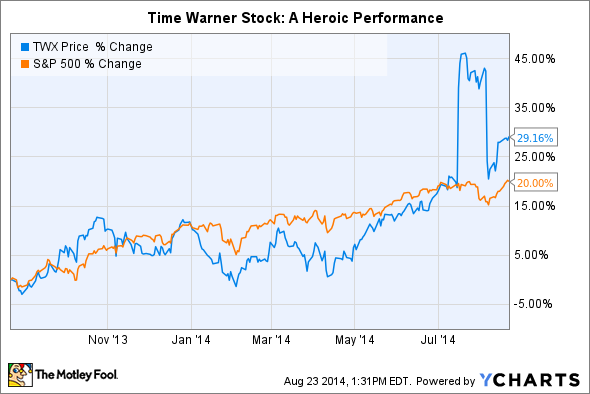 Is It Time to Buy Time Warner Stock? A strong and growing TV business could help push the stock well beyond Fox’s bid. Over the past year, Time Warner (NYSE:TWX.DL) stock has heaved, swayed, and surged like a ship on rough seas. All of this is despite strong Q2 results. Should we expect continued outperformance from Time Warner stock when compared with the broader market? I'm inclined to believe so. Here's why. In many ways, our businesses look pretty similar. I think it gave us confidence in the ability to manage and navigate it and really did enable us to create scale in almost every place, whether it's TV studio, film studio, entertainment networks, sports, kids, news, nonfiction, that they really were pretty good mirrors of each other and, therefore, really created scale -- advanced scale. In other words, Time Warner is one of the industry's few multi-platform entertainment leaders. A company that -- like Fox -- has strong products for both television and film, including a diverse set of programming. Mix in budding franchises with long-term potential, and you've a formula for achieving outperformance. If new franchises are the catalyst -- I'm thinking mostly of DC Comics properties, both on television and in theaters -- then television is the core. Pay TV, in particular. HBO is a big contributor to Time Warner's profit picture thanks to original programming. More recently, the first-season finale for the anthology series True Detective broke the Internet and Game of Thrones set a new viewership record. More than 19 million tuned in to Season 4 after counting all sources -- live, rebroadcasts, DVR, downloads, etc. -- the biggest-ever audience for a season of an HBO original series. Profits are soaring as a result. HBO's operating income grew 22.7% year over year in the second quarter. Revenue grew 16.5% over the same period. Last year, HBO grew 8.5% and 4.4%, respectively. Signs point to accelerated gains in this part of Time Warner's business. Season 4 of Game of Thrones was the most-watched HBO original series in network history. Credit: HBO. Warner Bros. also has experience producing tamer forms of entertainment. In fact, the studio produces quite a bit of it for other network operators. CBS is a regular customer, buying distribution rights to The Big Bang Theory and Person of Interest, among other shows. Each program reaches tens of millions of prime time viewers. "Heading into the 2014 to '15 TV season, Warner's is, again, the No. 1 producer of shows for broadcast," Time Warner CEO Jeff Bewkes said during Warner's latest conference call with analysts. "That's a position we've held for 11 of the past 12 seasons. Starting this fall, Warner will have 31 shows on broadcast networks, including at least two primetime series on each network and 60 shows overall across broadcast and cable." He's including a range of new DC Comics adaptations -- including Constantine on NBC, Gotham on Fox, and The Flash on TheCW -- in that list. Arrow is already TheCW's most-viewed program. Seven seasons in, The Big Bang Theory remains one of the most popular shows on broadcast TV. Credit: CBS/Warner Bros. Television. Finally, I'd be remiss if I didn't mention Turner Broadcasting. The network behind TBS and TNT produces a little more than half of Warner's operating profit -- capital that Bewkes and team use to reinvest in new projects across the rest of the business. They have a good record: Returns on capital are up in each of the past five years and over the trailing 12 months. Of course, none of that would matter if Time Warner stock was too expensive to own at current levels. I don't think that's the case, and neither does Rupert Murdoch given his recent bid for the company. Mix in accelerating profit gains at HBO, a thriving broadcast TV business, and DC Comics adaptations, and Time Warner stock could go much higher in the years ahead.